Special occasion cards in Japan have these cool wire bows on them. They are shaped like cranes or flowers and can get pretty elaborate. Cards like these are meant to hold money, and you can buy a simple one at any 100 yen shop or convenient store, or spend a small fortune on one to hold the small fortune that is your gift. 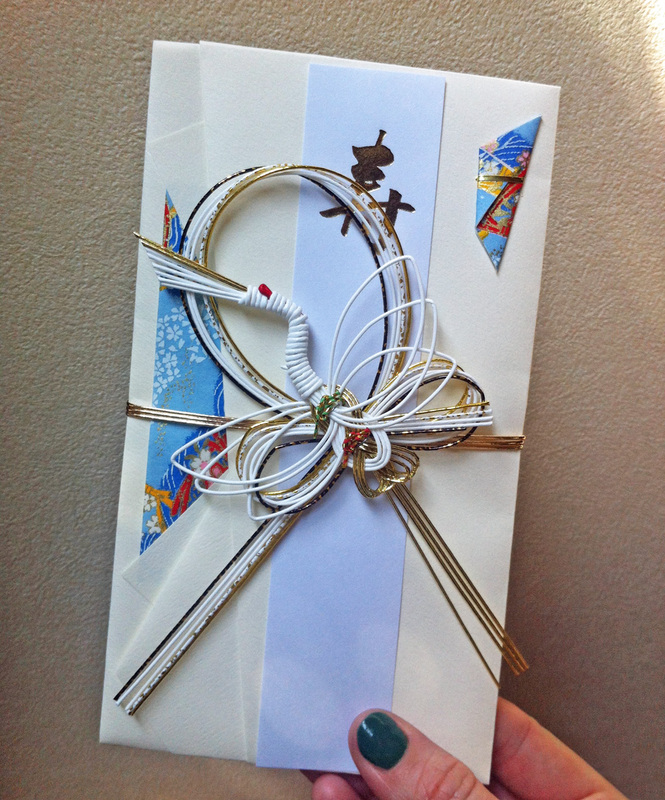 Dan and I recently went to Nagano and were invited to a craft class to learn mizuhiki, this fancy bow art. 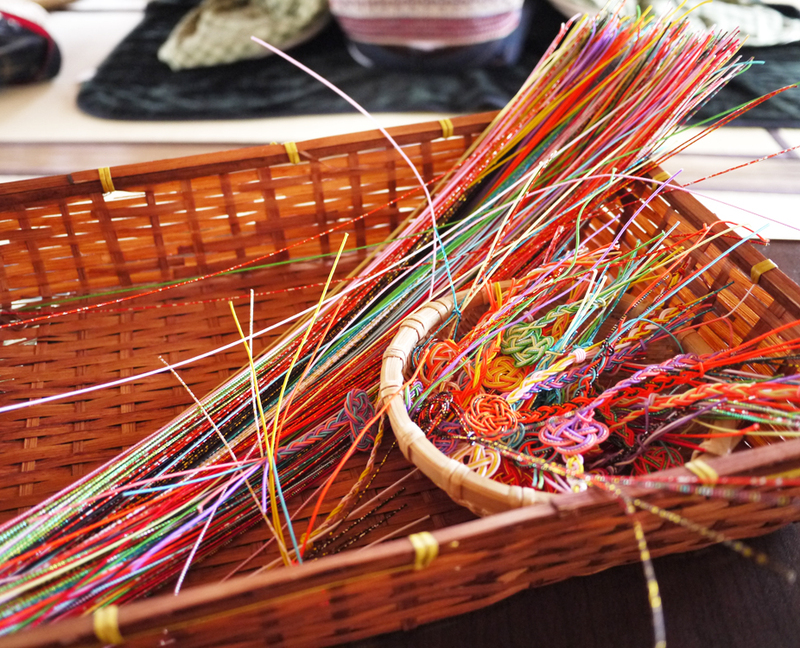 Mizuhiki are made from cords of tightly wound washi paper that is starched and colored and twisted into shapes. They were popularized during the Edo era as samurai hair accessories and are now used as decoration to convey well wishes. Our sensei told us to choose three colored cords and because I am a cocky over achiever I chose four. We opted to make bookmarks, followed the instructions printed for us and were left alone to figure it out. The trick is to maintain the same order of your colors throughout the design, even through the curves and weaving. Tighten one too much and it pops out of place and then you have to loosen the entire thing to right it again. Let me assure you, it is harder than it looks. This entry was posted in Crafts and tagged Japan, mizuhiki, traditional Japanese crafts. Bookmark the permalink. Cute! I’ve never heard about mizuhiki but it looks very similar to Chinese decorative knots. I bet they should be related somehow. Did Dan make the yellow/blue/brown bookmarker? Yes, mine is the one that looks like it’s been done by a person more interested in jumping into the next hot spring and why oh why are they making this person do crafts when there is a hot spring in sight. I am a lot like that person. I should try that at some point! I’ve wanted to learn fancy knotting for a while now, and have a few dozen pages and tutorials bookmarked, but never seem to get around to actually experimenting with it. Is it something that would be easier with embroidery floss or yarn, do you think, or would the stiffness of the wires make it easier to shape in the beginning? I think thread or yarn might be tough. 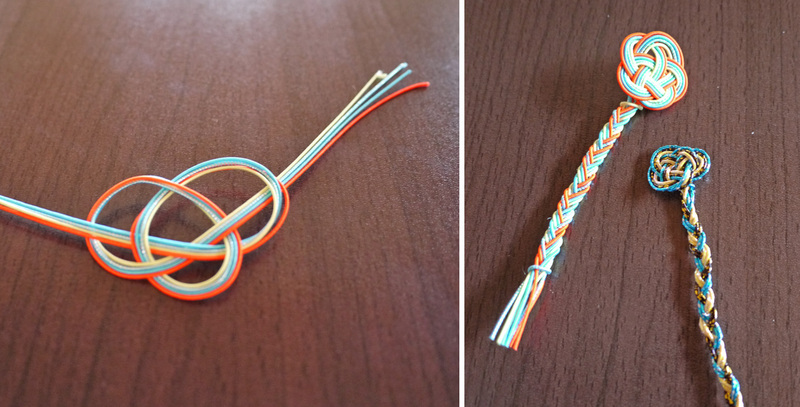 You could try pipe cleaners! That is lovely. It reminds me of Celtic knotting–I haven’t been exposed yet to such pretty knotting techniques of mizuhiki or any other Asian knotting techniques. Beautiful! I think mizuhiki would work really well with some Irish Celtic knots, it’s the first think I thought of when I so the instructions in the photo, there’s the Bridget’s Cross that would work very well.